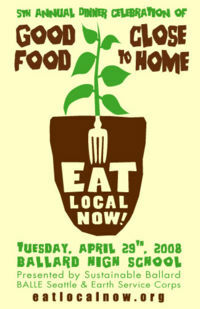 Eat Local Now! was an annual local food dinner celebrating local food prepared lovingly by local chefs. Participants would talk with the folks who produce food, enjoy a relaxing meal with their neighbors, and support local businesses. Always a sell-out, Sustainable Ballard and BALLE Seattle promoted year-round support of local food, raised awareness about local farming issues, and give neighbors the opportunity to share in community with those who feed them. The first two years of this event were produced by BALLE Seattle under another name with an attendance of 50 or so. Sustainable Ballard and BALLE joined forces in 2006 and coined the name “Eat Local Now.” Attendance soared to 250 people – in the largest venues we could afford in Ballard and attracted folks from across the city. In the second year (2007) of this collaboration the Ballard High School Earth Service Corps was enlisted into the partnership. After our 3rd year, although this was awesome event and highly popular, we at Sustainable Ballard realized that it was not meeting our goals to educate, engage and inspire our neighbors to live more sustainably. The event drew mostly those who were already very knowledgeable about local food and the majority of attendees were non-Ballard residents. Meanwhile, Sustainable West Seattle had started their own annual Eat Local Now dinner with BALLE – a Fall event, while ours had been Spring. The event continued to grow and flourish through 2011. Details of the menus, speakers and partners can be found on the Eat Local Now website.